Relax and lose that belly fat, as suggested by recent research! Check out what we’ve discovered about this fascinating connection. Believe it or not, blood sugar crashes triggered by chronic stress, coupled with stress-driven food cravings, may lead to fat deposition in a very specific part of the body. 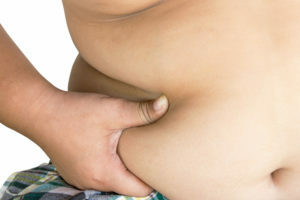 That dreaded “spare tire” that many stressed out people who otherwise eat healthy and lead active lifestyles are all too familiar with is actually the surface manifestation of visceral fat contained within the abdomen and encasing the abdominal cavity organs. You got it, a fat liver, two fat kidneys, a fat pancreas, and fat small and large intestines, all of which significantly increase your risk of chronic diseases and are all major predictors of mortality. And all of which may be directly related to stress according to recent research. Stress is typically seen as the bad guy, but it actually evolved to be very adaptive in helping us maintain energy homeostasis or, simply put, balance. Stress was intended (and still does, in the right, small amounts) to help our bodies deal with an ever-changing environment by regulating blood sugar balance via our stress hormones cortisol and adrenaline. Cortisol increases blood sugar by releasing stores from the liver, whereas adrenalin makes sure that the sugar gets to the brain in a nice, tightly regulated manner … or so it was evolved to do. The problem is that we have out-evolved this important stress response by being so stressed out all the time, and have gotten ourselves into serious trouble by not being able to relax and just be happy. When we are angry, jacked up and just plain old stressed out over the long term (ie. note, this means more than a couple of minutes in the science world) our blood sugar crashes, and we enter into a state called hypoglycemia (low blood sugar) and eventually neuroglycopenia (low brain sugar) where we experience irritability, anxiety, mood swings, headaches, and dizziness—most of us have all been there at one point or another, and for those of us that are chronically stressed out, this becomes a daily thing. Most importantly, neuroglycopenia impairs our concentration, memory, and judgement … and initiates intense cravings for simple, refined carbohydrates that will get sugar to our brains the fastest. Welcome to emotional, or comfort, feeding—and into the cycle that research is suggesting may lead to belly fat. We bet many of you are surprised to find out just how important a role stress can play in the development of belly fat. It may in fact also be the culprit behind why it is so darn hard to lose this unique type of fat despite eating well and exercising, but it is too early to say for sure so stay tuned on this point. Losing belly fat may in fact be as simple (or as difficult*) as relaxing, and feeling genuine happiness and gratitude towards yourself and those around you. We don’t recommend using a scale to gauge weight loss “success,” but we bet your clothes will start fitting a little looser once you master this theory that currently has the science community excited and hard at work studying. *For those of you for whom stress is an inevitable part of life, we hear you. Learn how to effectively manage the physical consequences of stress naturally, with nutrition and lifestyle programs in our Blood Sugar App and Weight Management App!